作 者：Nast A, Boehncke WH, Mrowietz U, Ockenfels HM, Philipp S, Reich K, Rosenbach T, Sammain A, Schlaeger M, Sebastian M, Sterry W, Streit V, Augustin M, Erdmann R, Klaus J, Koza J, Müller S, Orzechowski HD, Rosumeck S, Schmid-Ott G, Weberschock T, Rzany B.
Psoriasis vulgaris is a common and often chronic inflammatory skin disease. The incidence of psoriasis in Western industrialized countries ranges from 1.5 to 2%. Patients afflicted with severe psoriasis vulgaris may experience a significant reduction in quality of life. Despite the large variety of treatment options available, patient surveys have revealed insufficient satisfaction with the efficacy of available treatments and a high rate of medication non-compliance (Richards et al. in J Am Acad Dermatol 41(4):581-583, 1999). To optimize the treatment of psoriasis in Germany, the Deutsche Dermatologische Gesellschaft (DDG) and the Berufsverband Deutscher Dermatologen (BVDD) have initiated a project to develop evidence-based guidelines for the management of psoriasis first published in 2006 and now updated in 2011. 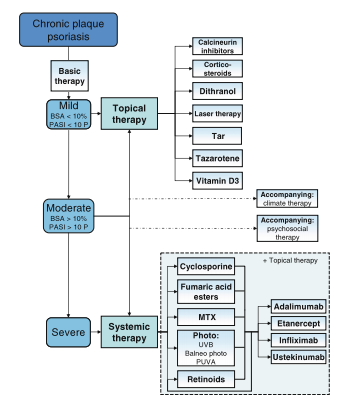 The Guidelines focus on induction therapy in cases of mild, moderate, and severe plaque-type psoriasis in adults. This short version of the guidelines presents the resulting series of therapeutic recommendations, which were based on a systematic literature search and discussed and approved by a team of dermatology experts. In addition to the therapeutic recommendations provided in this short version, the full version of the guidelines includes information on contraindications, adverse events, drug interactions, practicality, and costs, as well as detailed information on how best to apply the treatments described .